Discover your inspiration with our sharpest display to date. See a new level of clarity in your creations with a 24" monitor featuring Ultra HD resolution and our highest pixel density yet. Ultra HD 3840 x 2160: Get four times the resolution of Full HD and see the finest details in your schematics, designs and photos. Vivid, reliable color: PremierColor provides true color accuracy as well as 99% AdobeRGB and 100% sRGB coverage. Adjusts to how you work: Ultrawide viewing angles, plus tilt, swivel, pivot and height adjustment features enable an uninhibited view. 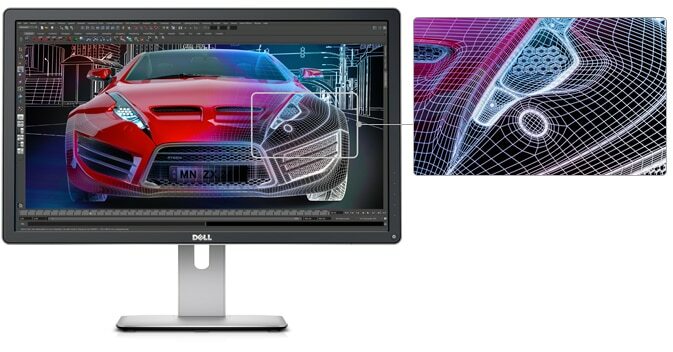 Whether it’s video editing, CGI animation or application and game development, the DellTM UltraSharp 24 Monitor – UP2414Q gives you an up-close-and-personal view. Our Our highest pixel density sharpens the tiniest details in videos and images for stunning results. Ultra HD 3840 x 2160 packs in four times the resolution of Full HD. Get a clear and consistent view with an ultrawide 178°/178° viewing angle. Keep your virtual workspace organized with the Dell Display Manager’s Easy Arrange feature that lets you neatly display windows side by side. PremierColor technology delivers vivid, true-to-life color and professional tools for detailed projects. Work confidently knowing your monitor is compatible with major industry color standards, and has wide color coverage such as 99% AdobeRGB and 100% sRGB. Get exceptional color accuracy and consistency, right out of the box, with precise factory calibration to a Delta-E<2. Reveal a high level of detail, even in dark areas, with a color depth of 1.07 billion colors. Fine-tune your colors using the Custom Color mode, or make further adjustments with the user-accessible hardware look-up table (LUT). Create a custom color palette using Dell UltraSharp Color Calibration Solution software with the optional X-Rite i1Display Pro colorimeter* (sold separately). Get extensive connectivity with HDMI, DisplayPort, mini-DisplayPort, four USB 3.0 ports and a 6-in-1 media card reader. 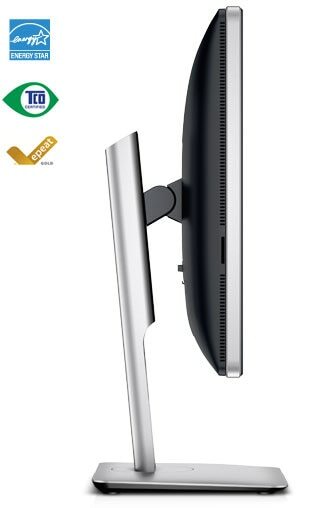 The Dell UltraSharp 24 Monitor meets the latest regulatory and environmental standards. Made with premium-quality materials, the UP2414Q is BFR/PVC-free (excluding external cables) and has arsenic-free glass, a mercury-free LED panel and a chassis made of more than 25 percent post-consumer recycled plastics. 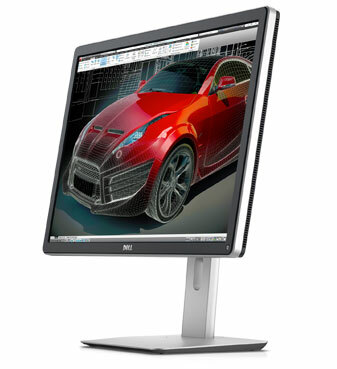 Your Dell UltraSharp 24 Monitor – UP2414Q is just the start. Look for these great additions when finalizing your purchase. Get precise colors that match your work with what you see onscreen using a fast and flexible colorimeter. Snap the Dell Sound bar snugly to the bottom of your monitor to enjoy rich audio. Secure your monitor with a super-strong, carbon-tempered steel cable lock that easily attaches to your monitor.